In Brighton & Hove our children's services bring together education, health and social care for all 0 to 19-year-olds (and up to 25 years for those with special needs). They work in partnership with other health services as well as community and voluntary organisations in the city. Many services are offered by neighbourhood based teams, while some are delivered by city-wide teams. In May 2016 we were inspected by Ofsted and the Care Quality Commission on our services for children and young people with special educational needs and disabilities and you can read the inspection letter here (PDF 242). We then had a follow up letter from the Minister of State for Vulnerable Children and Families (PDF 649) acknowledging the positive outcome of the inspection. If you are a member of the public and worried about a child's welfare please contact our Front Door for Families. We provide training for everyone working with children, young people and their families. Our training is available to community and voluntary sector organisations, other public sector organisations and private businesses in the city. 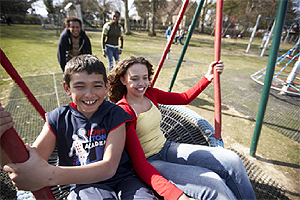 We are looking for social workers to help children in Brighton & Hove. Look at our guide to working for Brighton & Hove children's services to find out more.